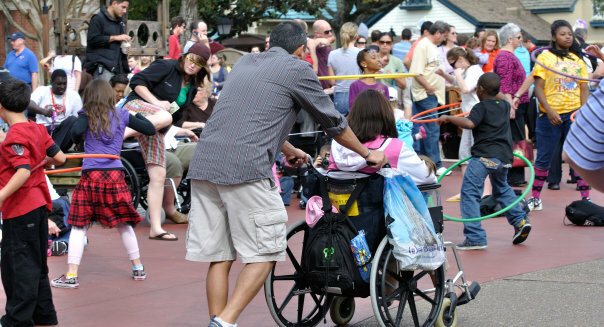 The new Disability Access Service system at Disney World and Disneyland isn’t making many guests happy in the Happiest Place on Earth. Disney’s new program for physically and mentally handicapped guests replaced the more useful, yet widely abused, Guest Assistance Card program that was shuttered on Oct. 9. I predicted the change would be trouble, covering the news earlier this month. And Disney (DIS), too, knew that it would be a rough transition. The previous service offered no-wait access to theme park rides and attractions for disabled guests and their families, making vacations that would still be difficult somewhat easier. However, unofficial disabled “tour guides” got into the act, charging vacationers a pretty penny for the expedited access their disability passes provided. Wealthy but ethically bankrupt families bragged about using them to bypass the long lines endured by the masses, and a wave of outrage sank the old program. My family hit all four of the Disney World parks this past weekend with my special needs son, and DAS didn’t win high marks. I blogged about Disability Access Service — how it works, how it doesn’t, and how it can be gamed — and have concluded that it’s the worst of both worlds. Though Disney reportedly worked with advocacy group Autism Speaks to come up with a plan that would meet the needs of families with children on the autism spectrum, the new system is more inconvenient for the families that need it, yet can still be circumvented by those willing to abuse the platform in the first place. ← Disneyland News: Iron Man Heads To Disneyland: Is This The Beginning Of A Marvel Invasion?